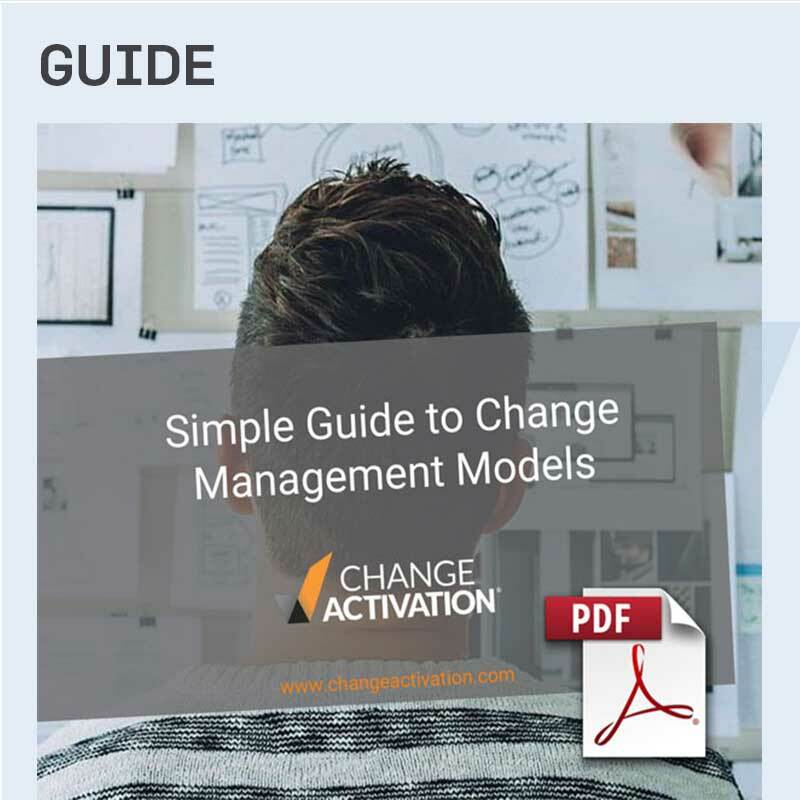 We've outlined the world's most prominent change management methodologies and models to help you choose the right approach for your change. Step-by-step change methodologies (also known as 'linear' methodologies) prescribe a recommended pathway of stages or phases, consisting of particular activities to work through in order to achieve lasting change. Rather than showing how to implement a change project from an organizational perspective, these two models focus on the psychological journey through which individuals typically move as they experience change. These models are useful when considering change from the perspective of the individual. These three models prescribe broad interconnected organizational competencies that are required for effective change management. Organizations that wish to build the ability to make successful changes (change agility) can use the competencies as benchmarks to work towards. ADKAR is an acronym that describes the five stages that individuals ideally progress through in order to successfully move through a change. ADKAR is Prosci's model for understanding the shifts that individuals make rather than a step-by-step methodology for implementing organizational changes. 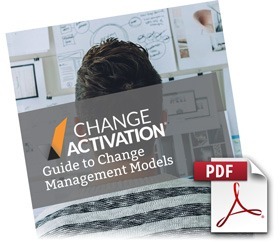 The ADKAR change management model was first published in the 1998 book "The Perfect Change" by Jeff Hiatt, founder and CEO of Prosci Research. See Hiatt. J.M. (2006) ADKAR: a Model for change in business, government and our community. Agile Project Management and Agile Management are increasingly utilized by organisations outside of the realm of software development. Agile has been adopted by organizations to describe the process of developing new products rapidly through collaboration despite evolving requirements. The following 5 values should be adhered to by groups wishing to successfully develop products quickly that are fit for purpose despite continually shifting requirements. These 12 Agile Principles are the principles that groups should follow in order to achieve agile development capability. The Accelerated Implementation Methodology features 6 goals that are designed to be approached in a linear manner in order to achieve a successful change. The Beckhard and Harris Change Management Process is seven step linear process for implementing a change. The formula suggests that the three components dissatisfaction, vision and first steps must be present in a sufficient quantity to overcome resistance to change. Boston Consulting Group's 'Change Delta' approach to change management is a non-linear approach to change featuring four 'Change Deltas' that organizations require in order to effectively manage portfolios of change successfully. Each of the change deltas is an ongoing process and feeds in and reinforces the other deltas in building long lasting capability. The Bridges Leading Transition Model for Change features 3 overarching stages as well as suggested activities within each of these stages. Bridges explores human behaviors relating to change and defines typical emotions individuals might exhibit during the change process. Bridges provides strategies on how to overcome some of the emotional barriers to change, without getting stuck. For example, in the New Beginning phase, there may be a great deal of fear of the unknown. One strategy might be to provide training on specific tools or educational materials. In the Neutral Zone, allow creative ways to think about work. During the Ending and Losing phase, people will feel committed and requires the need to sustain the new way of working, possibly through goal setting. See Bridges. W. (2009). Managing transitions: Making the most of change. The Change Leader's Roadmap is a linear methodology for approaching organizational changes through a 9 phase process. See Anderson, L.A. & Anderson, D. (2010) The change leaders roadmap. The General Electric Change Acceleration Process (CAP) is a linear methodology for organizational change featuring seven phases. The Kotter Eight Step Change model is a linear change methodology that focuses on the importance of gaining buy-in. It is relatively simple to understand and works well in organizations that are organized in a relatively narrow organizational structure. One of its key selling points is its simplicity, memorable eight steps and basis in Kotter's years of research into organizational change. See Kotter, J.P. (1996). Leading Change and Kotter, J. (1998) Leading change: Why transformation efforts fail , Harvard Business Review. The Kubler Ross Change Curve model of individual change originally described how individuals react to grief, and has subsequently been applied to the context of individuals reactions to change. These 5 stages are a linear model that describes the journey that individuals undergo during changes. The aim for those leading changes being to ensure that the final stage of 'acceptance' is reached quickly. One of the most famous approaches to change, the Lewin Three Stage Change Management Methodology is a linear methodology describing 3 stages for approaching an organizational change with activities within each stage. The Lewin 3 stage approach is increasingly at odds with approaches that suggest that organizational change is constantly occurring and an ongoing process. The LaMarsh Managed Change™ model is a 4 stage linear methodology to implementing organizational changes. The People Centered Implementation (PCI) Model proposes 6 interdependent critical success factors that enable organizations to achieve successful changes. Like BCG's Change Deltas and Prosci's Change Levers, this is an approach to important factors that contribute to organizational change capability rather than a step-by-step guide to executing changes. The Prosci Enterprise Change Management methodology is a linear methodology for approaching organizational changes. It features 3 main stages, each with activities within designed to guide the implementation of change. In addition to both its Enterprise Change Management methodology and ADKAR model for individual change, Prosci suggests there are 5 change management 'levers' that are critical to enabling organizational change effectiveness. The 5 Prosci change levers may be seen as analagous to BCG's Change Deltas in that they constitute overarching interdependent capabilities that organizations should build in order to maximize their ability to make effective changes. Note: Information regarding proprietary change management methodologies is provided here for information and comparison purposes only and is not endorsed by the publishers of such methodologies. Links to other websites are provided as useful sources of information. Inclusion of a link to another website does not imply endorsement of any kind. We do not monitor external websites and are not responsible for their availability, quality or content.